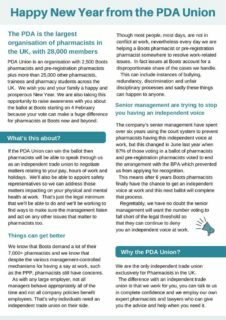 All store/relief pharmacists and pre-registration pharmacists at levels 5,6 and 7 who are employed by Boots Management Services Ltd are entitled to vote in the ballot at Boots. 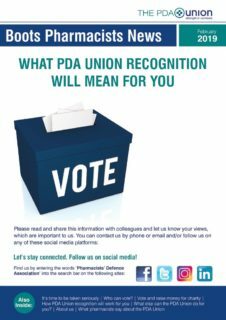 You can vote whether or not you are a PDA Union member. The union has already sent the following two publications to the recorded home addresses of eligible pharmacists and pre-registration pharmacists via an independent person appointed by the Central Arbitration Committee (CAC). Important: If you consider that you are eligible to vote and have not received a ballot paper by 22 February 2019, or if you do not think that you are eligible to vote but receive a ballot paper, please contact the CAC Case Manager, Linda Lehan, by email at llehan@cac.gov.uk giving your full name and address. If you have recently changed your address and you have not informed your employer you should do so as soon as possible to ensure you receive your ballot paper on time.